Team Techeetah's podium finish in its inaugural FIA Formula E Championship has boosted the Chinese entry's commitment to excellence in the all-electric motor-racing series. 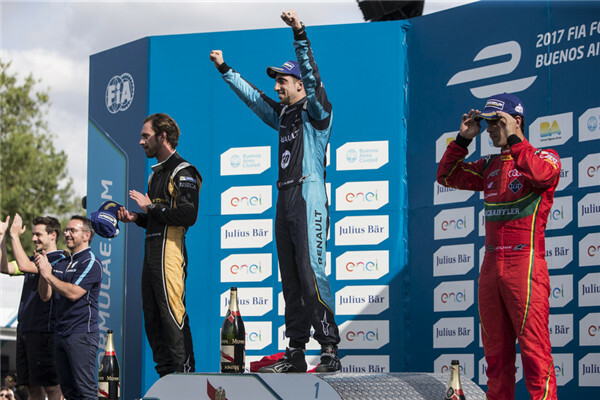 Techeetah, which was founded prior to the 2016-17 campaign by Chinese sports-marketing company SECA, overcame some early-season setbacks as veteran driver Jean-Eric Vergne finished runner-up to defending series champion Sebastien Buemi of Renault e.dams in Saturday's Buenos Aires ePrix. Lucas di Grassi of ABT Schaeffler Audi Sport finished third after battling through some mechanical issues that slowed him down from the pole position midway through the race. As the new entry's first podium finish in the 10-team competition, Vergne's impressive run has fired up Techeetah, which was plagued by accidents and technical issues during the first two races of the 12-leg season, in Hong Kong and Marrakesh. "We had a very stressful start in the first two races, but the result here gives us a timely push to keep working hard," Ivan Yim, managing director of Techeetah, told China Daily during a post-race celebration in the pit. After acquiring the former Team Aguri last July, SECA announced plans to build Techeetah around Vergne and homegrown driver Ma Qinghua for the third season of the championship. Techeetah signed former Williams and Jaguar Formula One team manager David Stubbs in November to oversee operational matters. "We had only 90 days to get the cars and the team ready for the season," said Yim. "The break between Marrakesh and this race gave us a chance to catch up. We did a lot of things within the team itself, upgrading a lot of our equipment and bringing in new people, including mechanics." Formula E has struck a chord with a growing number of electric vehicle manufacturers, from small startups to big-name brands such as Audi and Jaguar, which see the championship as a testing ground for the latest technology in powertrain and battery developments. Electric-motor specialists such as Chinese company NextEV Nio and China-funded Faraday Future in the US have also climbed onboard. Yim said Ma's emergence as the only Chinese driver on the grid helps Techeetah stand out as a legitimate force in the championship. "He is building gradually. His experience and strength were in the World Touring Car Championship, which is different. We keep working with him, we brought a driver coach along," Yim said of Ma, who won multiple titles in the WTCC. The 29-year-old Ma, who practiced at his home race in Shanghai in 2013 after becoming China's first driver to hold a Formula One super license, is cautiously optimistic about the rest of the season. "We are a new team that needs enough trace minutes and miles to adjust our technology for more consistent performances," said Ma. "I feel much more confident this year with a new engineer." Team Techeetah's podium finish in FIA Formula E has boosted the Chinese entry's commitment to excellence.